What hasn't seen a release of Don Bluth's laserdisc classic Dragon's Lair? Well, you can't answer the iPhone, because Digital Leisure and EA Mobile have sent Dirk the Daring forth upon the iTunes App Store. The beautifully animated game of memorization, reflex and Princess Daphne rescue is available for a paltry sum, just $4.99 USD. That's a guarantee that I'll, once again, invest in another copy of Dragon's Lair, realize how terrible I am at such things and put it aside. But the early reviews on iTunes appear to be mostly positive. 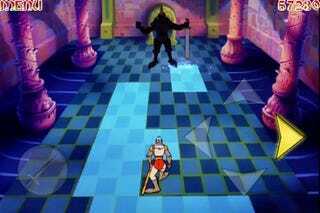 Maybe another crack at Dragon's Lair is worth the download?